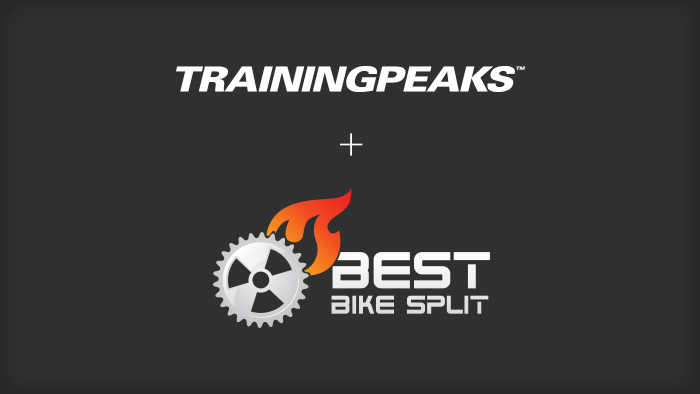 Today, I am excited to announce that TrainingPeaks has acquired Best Bike Split, the most advanced training and race prediction software available for cyclists and triathletes. With BBS, athletes and coaches are able to predict the power needed to reach a goal time, plan power targets for optimal training, and create a power based plan for race day success. BBS uses data like your current fitness, combined with equipment, course conditions and even weather data for incredible accuracy. Check it out at www.bestbikesplit.com. Created by Chief Scientist, Ryan Cooper and Chief Creative, Rich Harpel, BBS was created to help riders of all abilities to predict, train and plan for race day. Cooper will be relocating to Boulder, Colorado while Harpel will remain in Austin, Texas. Both will continue to oversee the addition of new features, functions and improved modeling for Best Bike Split. I first discovered BBS back in June while training for an upcoming duathlon. I selected the race course, one of thousands available, and had BBS calculate my predicted bike time. As I continued to experiment with the site’s modeling tools, I was blown away by what they had developed. I encourage you to create an account, enter your fitness information (threshold power) and bike details, then select a course or import one for an upcoming race. You’ll see that it has a lot of options to fine-tune and dial-in your settings. Try calibrating the various settings by entering an old race and see how close it comes to your past bike time. 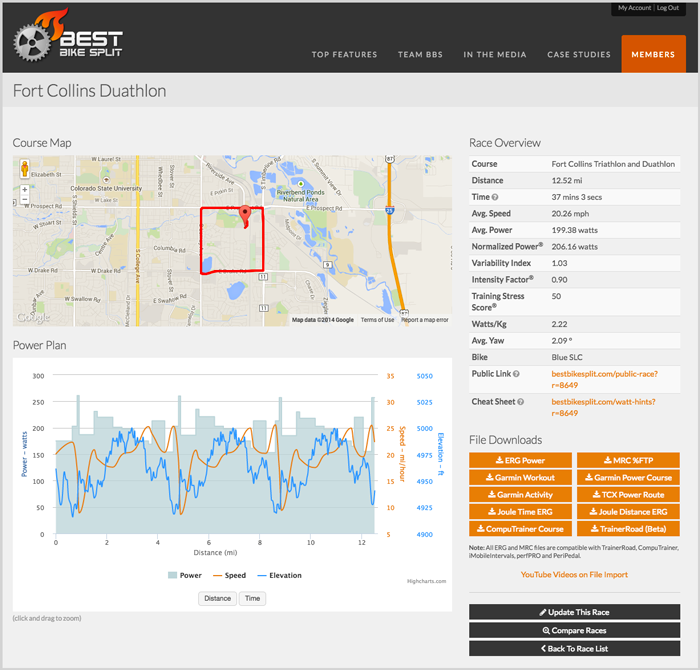 There are many other useful features than just predicting your finish times. My favorite is that it uses a high-performance optimization engine to create a pacing chart and pacing cheat-sheet that you can print and put on your bike stem for reference during the race. If I wanted to, I could have uploaded a detailed plan to my Garmin that would show me what power to hold for every section during the race. I ended up beating my estimated time by about 1 minute, and it served as a great motivator and guide on race day. From that point on, I was hooked. If I had more time with the site, I would have used it’s many export options to import the course to an indoor trainer and simulate the event during training. To showcase the accuracy of BBS, during the 2013 Tour de France, Cooper was able to predict the times of several top contenders for the Stage 11 time trial. His model was within 3 seconds of Alberto Contador’s finish time, 9 seconds of Chris Froome’s and 11 seconds of Tony Martin’s. BBS is also being leveraged by triathletes to predict and train for their bike leg in order to have the best race possible. Professional triathlete TJ Tollakson used BBS to create his race day power plan and went on to win and set a new course record at IRONMAN Mont Tremblant. TJ’s model was only 1:20 slower than his actual time over the 112 mile ride. Here at the office, co-founder Dirk Friel used BBS to model his time for a favorite training ride up Left Hand Canyon, in Boulder. He was within 6 seconds of his predicted time on a climb over 16 miles long. The next evolution of data driven training is predictive planning, which will be a driving force behind TrainingPeaks. It allows you to predict your wattage or time, train specifically for your goal event, lay out a precise race plan, and execute when it counts. There is also a Coach Edition of Best Bike Split. Coaches can create and manage up to 20 riders, share race day plans and race day execution files directly with their athletes. Create a coach account and see how you can take the next step in helping your athletes prepare for race day. We have a lot planned for improvements to Best Bike Split. For now, it’s a great compliment to TrainingPeaks and we will be very busy making it more powerful, adding more ways to model your performance to help you achieve your athletic dreams! Gear Fisher is the CEO and co-founder of TrainingPeaks. He uploaded his first power file in 2001 and continues to drive innovation for all endurance athletes and coaches. He is also the proud owner of a high performance bamboo mountain bike and can be found along the trails of the Front Range. Follow him on Twitter'@gearfisher.